TAPITA, A unique experience! Too bad it didn't last long! At Tappita - where the Salesians have recently reactivated a mission - people live on agriculture and the rhythm of the seasons and the rainfall decide on the harvest's quality and quantity. The rains also bring less pleasant side effects, especially in the field of health, housing and transport. In some moments one has the impression that life stops ... but no! Life goes on, the struggle gets harder, but one doesn't give up. In Italy there is the "Estate Ragazzi"; in Liberia and Sierra Leone, the "Holiday Camp" is organized for the young. 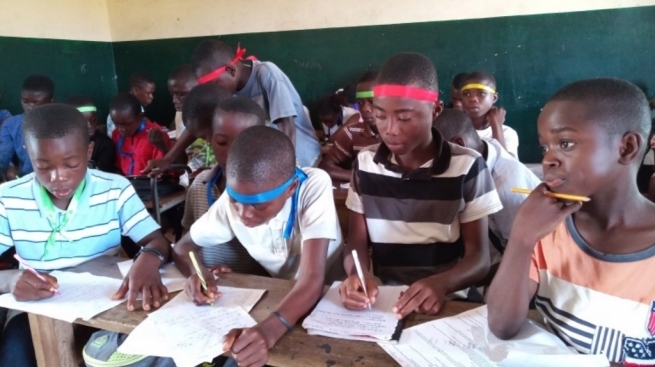 The substance remains the same: with schools closed in July and August, the children have more free time and the camp and its educational tasks keep them away from idleness and from the street. In truth, the children are never idle in Tappita: even during the school year, as soon as school ends or on Saturdays, the children follow their parents into the countryside, walk around the streets selling bags of water, candies, biscuits ... In this way they help to put food on the table – and into their bellies - before going to sleep. The Salesians on site alternated to illustrate various aspects of the training course for animators, adding the ingredients necessary to make it meaningful: full-time, from 9.00 to 17.00, including school lunch; school lessons in the most relevant subjects; learning the rudiments of several practical activities, such as computers, drawing, music, dance, baking and preparing desserts, tailoring and sewing; socializing activities: communal games, quiz competitions, dance competitions and drama performances according to the various cultural groups. All activities are framed in a point-scoring scheme for the four teams in which the participants were divided. At the end of the "Holiday Camp", there are prizes for everyone. The conclusion is unanimous: "A unique experience! Too bad it did not last long! It should last for the whole two months of the holidays!" As far as the community life of the Salesians is concerned, the "English-speaking West Africa" Province (AFW) organizes Spiritual Exercises, an opportunity to stop for a moment, pray, reflect and check if things are in order. They characterize moments of fraternity that also cancel the physical distance and the sense of isolation.